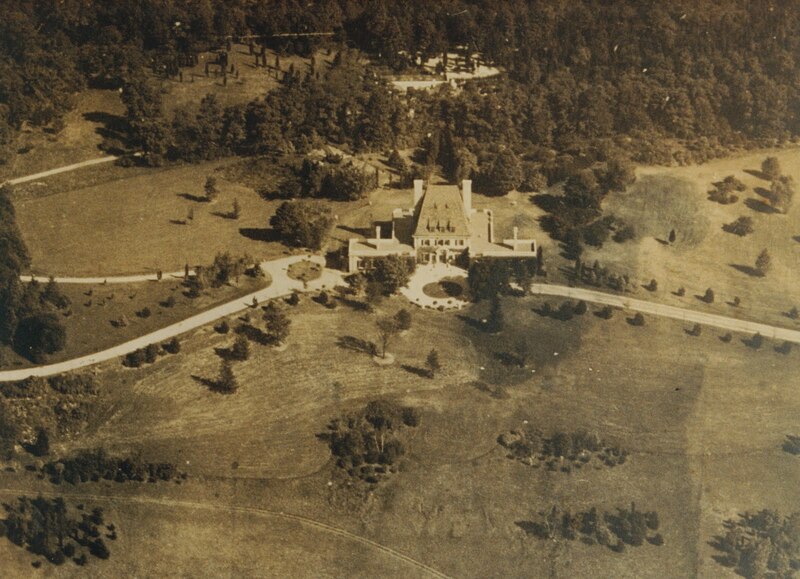 The third and final aerial of 'Chateau Ivor', the Charles A. Gould estate designed by John Russell Pope c. 1908 in Dix Hills. Click HERE for more on 'Chateau Ivor' (be sure to scroll past today's post). Photo from the Gould family collection. This was an interesting estate, I like much about it. Sigh. Now I'm consumed with curiousity as to what the unbuilt 'Castle' that the unfortunate Mr. Haydel designed for this Gould would have looked like. Have we mentioned yet today what a steep roof that was? I'm also curious as to how they would repair the corroding steel, wouldn't they have dismantle the whole castle to do that? I assume it wasn't Bessemer steel....or would that not have fared well either? I originally put this in a previous thread, but as it pertains to Charles A. Gould and the soon-to-be barking mad Abner Haydel, I thought I'd repost it. C. A. GOULD MULCTED FOR $5002. While off topic and not pertaining to this Gould's home, to repair corroding steel as in the H. Gould's Hempstead House, (see prior days threads) one would indeed have to dismantle the intricate stonework and repair and/or replace the steel, protect the steel finish, flash/waterproof and rebuild the masonry exterior walls. A daunting task and expensive one, but it can and should be done before it leads to severe structural issues. Nassau County obviously has decided to do the right thing and wait. Nassau County obviously has decided to do the right thing and wait. Just which "Nassau County" are we discussing? I know one of the reasons Nassau County has not undertaken the $10 million dollar restoration of the house is they just don't have the money (and likely never will). The preserve itself seems to barely generate any money either. Okay. Who opened the door for me to walk right into and rant about the incompetence and ignorance of Nassau County officials? To say they dont have the money is exactly what they tell us and they continue to obsolve themselves of their duties. Nassau County is one of the highest taxed regions in this country. It is inexcusable for the clueless and disinterested public officials to continue to destroy, by under funding, our local heritage and parks and museums due to their inability to govern. One classic case of icompetence and stupiduty at the highest level; Decades ago, the nearly picture perfect 1859 gothic revival Coles House was donated to Nassau County. It had to make way for development in Glen Cove. Nassau dismantled it and shipped it to Old Bethpage Village to re-erect. Work started, the framing was half finished, stairs went in, doors and windows and then the County cut the village's operating budget. All restoration work ceased. For well over a decade the half finished shell rotted away in the open air, suffered a partial collapse, achieved a ruinous state until it was eventually destroyed. Only about half, if that much, of the interior fittings and remaining structural elements survive today in storage somewhere? Who knows? The result is an award winning effort by Nassau County in complete incompetence and disgraceful failure. It is even embarassing to write about this example of our local commitment to preservation. Why taxpayers put up with this remains a mystery to me.